This morning, when I opened the fridge to prepare our lunches, and move the chicken for tonight from the freezer to the refrigerator, I saw some leftover rice from the pork chops we had the other night. Why not have it for breakfast, right? 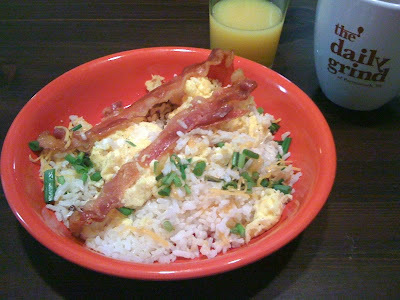 So, I heated up the leftover rice, scrambled some eggs, microwaved some bacon (In Michael's microwave, haha) chopped up a green onion, threw on some shredded cheddar and some fake butter and BAM. It was delicious. And, also a huge breakfast. So I know for sure I'll be having the turkey sandwich I made for lunch today, tomorrow. And I'm pretty sure M will too! I LOVE our breakfast time together. 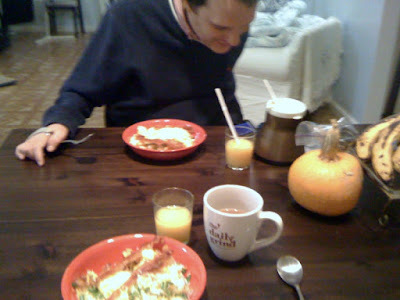 We usually eat dinner on lap trays watching TV in the living room, but breakfast is our sit down and talk and enjoy meal. We usually read the bible together (on our iPhones at the table) and it's just such a great way to start the day. Today, this yummy breakfast was followed by me getting a shoulder rub. Bonus points to the Hubs for that. Love him. Love his elbows.